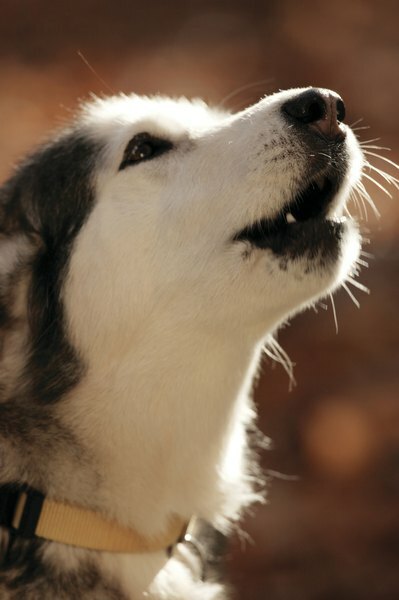 Barking is a communication tool for dogs. Instead of merely feeling annoyed by your dog's repetitive barking habit, make an honest attempt to figure out what exactly is compelling him to be so vocal and noisy, whether it's boredom or even extreme stress and anxiety. Dogs do not bark continuously without a rhyme or reason, after all. Dogs sometimes bark repetitively when they're feeling scared or worried about something. If it's late at night and your dog can clearly hear loud, thumping music coming from your party-throwing next door neighbors, he may react by barking, barking and barking some more. If something seems out of the ordinary to a dog, he'll likely react with fear. Excessive barking behaviors in dogs can signify tedium. If your poor pooch's barking seems immoderate and out of control, it may be an indication that he simply isn't receiving sufficient mental or physical stimulation. To remedy this, it's up to you to ensure that your dog has enough fun and interactive toys, gets enough daily physical exercise and also receives sufficient tender loving care courtesy of you. Dogs thrive when in the company of others, whether human, canine and sometimes even feline. Because of this, some doggies turn to continuous barking as a way of coping with solitude. If your dog is outside for too long or hasn't gotten acknowledgement from anyone in your household in a while, he may express his loneliness by barking -- a lot. Dogs can be just as savvy as any other animals, and your dog may bark excessively because he wants something from you, plain and simple. Perhaps your dog wants you to open up his new bag of doggie biscuits, or for you to take him for his afternoon walk. By barking the day away, your dog is certain that he'll get you to look his way -- and hopefully do what he want. A lot of animals are highly territorial, and dogs definitely have that instinct in them, big time. If your dog senses the presence of strange and unfamiliar people anywhere inside or directly outside of your home, he may bark as a means of defense -- and also of warning to the rest of the family. Dogs that engage in this type of territorial pattern usually display distinct body language, with their ears facing the front prominently. If it's around that time of day when your doggie expects one of his favorite people to return home, whether from school or work, he may bark endlessly in anticipation and excitement -- aww. Once said individual actually does get home, the barking may increase tenfold. If your dog won't stop barking, he may be suffering from some type of medical issue, whether it's a severe stomachache or wound somewhere on his body. Elderly dogs with hearing problems also sometimes bark a lot -- simply because they're confused as to why they can't hear any sound. Play it safe and take your dog to the vet if he's barking continuously and you can't figure out why. Dogs have some "copycat" tendencies, and your dog may bark continuously simply because he hears that the Lhasa apso across the road is doing so -- nothing more, nothing less. Animal Humane Society: Why is My Dog Barking? RSPCA Australia: What Causes Dogs to Bark Excessively? What Happens to a Cat or Dog After It's Spayed or Neutered? What Can a Kitten Drink? What Kind of Cat Makes a Good Pet? What Are the Three Coat Varieties for Dachshunds? What Does Antifreeze Do to Cats?